Polka Dot Nails for the #31DC2017Weekly - Polish Etc. Another late post for the challenge but I have been super sick for the past 4 days and just couldn't drag myself into the polish room to paint. But I am on the upswing now, so get ready for a bombardment of nails! This week, we are starting with the design prompts for the challenge. The first prompt is always the easiest, Polka Dots. I think dotticures are the first nail art designs that people attempt when they are starting out doing more than just painting their nails. They can be anything from simple little double side dots to more intricate mosaic patterns. For me, I like simple. So I did a gradient of dot sizes down the side of my nails for a fun little skittlette mani. Let me tell you the evolution of this manicure. I was inspired by a manicure that MissHollyBerries did with a mattified OPI Ginger Bells with dots of Essie Penny Talk along the side. She was originally inspired by my #doublesidedots manicures and tweaked it. (like nail art inception!) I came up with deep purple and bright gold for this skittlette. The base is P2 Cosmetics "Diva Expressiva" and the dots are Maybelline "Bold Gold" with a little textured gold bling on my pinkie from P2 Cosmetics "Precious". I mattified the deep purple creme with Glisten & Glows Matte Top Coat before adding the dots. A mistake I made...I didn't add a quick dry top coat to the creme polish before adding the matte top coat. You can see where it started to pull away from my tips. Oopsie! 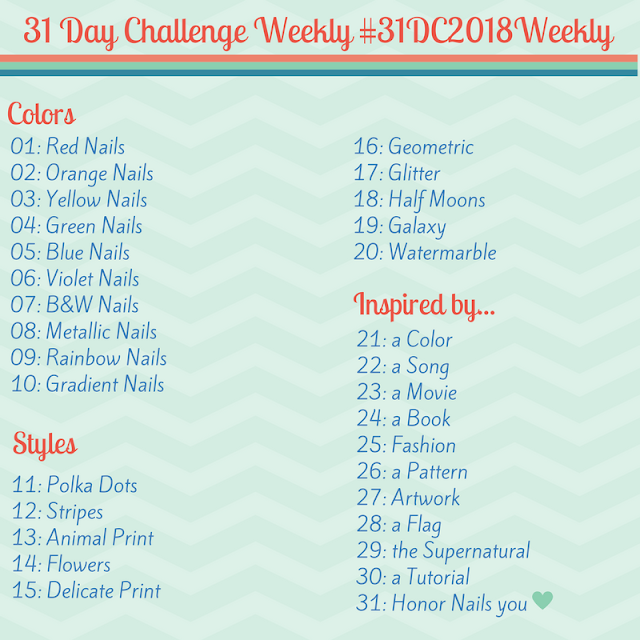 Be sure check out the tag #31DC2017Weekly tag on Instagram, Facebook and Twitter to see everyone else's fun manicures for the challenge!